I just want to share info about the history of the independence of the Republic of Indonesia which was never published or taught in schools, namely about support for Indonesia's independence by the Arab states. 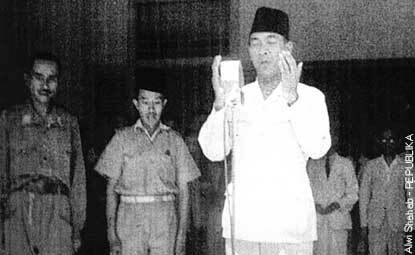 Soekarno and Hatta could proclaim Indonesia's de facto independence on August 17, 1945, but keep in mind that to stand up (de jure) as a sovereign country, Indonesia needs recognition from other nations. At this point we helped with the recognition of figures Middle East leaders, so that Indonesia could be a sovereign state. Even some Ulama in Egypt and the Arab World formed "Lajnatud Difa'i'an Indonesia" (Indonesian Defence Committee) by their own initiative. The agency declared on October 16, 1945 at the Islamic Youth Center Building Society with Gen. Saleh Harb Pasha as head of the meeting. In this photo: "Indonesian Defence Committee" consisting of the chiefs of Egypt, Arab, and Islam. 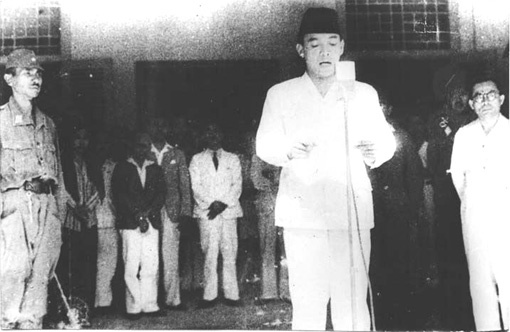 In the middle is Sutan Syahrir, in his right Gen. Saleh Harb Pasha (Chairman), Hassan Al-Banna and in his left Sheikh A. Latif Diraz , Dr. M. Salahuddin Pasha, Dr. A. Wahab Azzam Pasha, and stand behind Sutan Syahrir, Ahmad Hussein, and M. Salim and several Central Committee leadership. 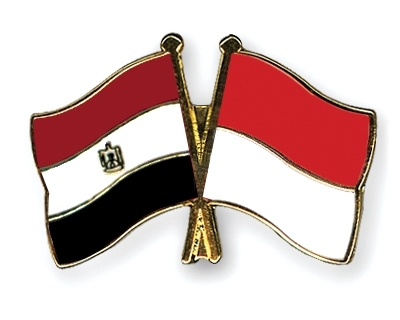 The strong support of the Egyptian people for the independence of Indonesia, due the insistence and lobbying the leaders of Al-Ikhwan Al-Moslem, that made the Egyptian government recognizes the government of Indonesia's sovereignty over Indonesia on March 22, 1946. In this photo: Haj Amin Al-Husseini (third man from right), Mufti of Palestine with the Indonesian Foreign Minister Haj Agus Salim (second man from right), Eltaher (on the right end) and others in Cairo in 1946. 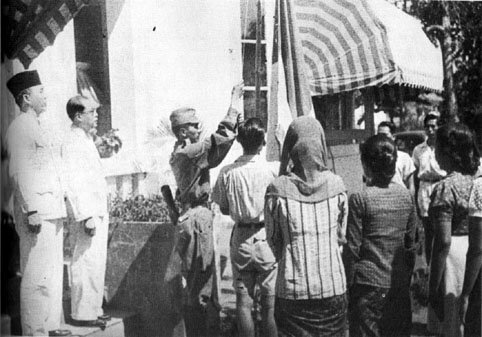 In this photo: The first official Indonesian delegation following the independence of Indonesia and the declaration of the republic arrived in Egypt during the summer of 1946. The delegation was headed by Haji Agus Salim (the second man from left), first Indonesian Deputy Prime Minister and Minister of Foreign Affairs, and held a meeting with Eltaher at “Dar Ashoura” in Cairo. After that, officially the Arab League Council's decision dated 18 November 1946 recommended to all member states of the Arab League to recognize Indonesia as a sovereign independent state. In this photo: Grand Mufti of Palestine M. Amin Husaini, (with turban) and Mohammad Ali Taher, the Palestinian leader (on his left) along with Central Committee, after he was able to escape to Cairo from the arrest of Allies in Europe and got protection of King Faruk. In this photo: From right to left; The tunisian nationalist Habib Bourguiba bidding farewell to Mohamed Hatta, Vice President of Indonesia. Standing on the left is Mohamed Rashidi, Ambassador of Indonesia to Egypt. Picture taken at the entrance to the Indonesian embassy in Cairo on April 15, 1951. In this photo: Egypt perpetuate the name of the street, Ahmed Sokarno St., Who headed the city center and cultural center in Tahrir Square. Morocco also made ​​a name streets in the capital, Rabat, with "sharia al-Rais Ahmed Sukarno" transformed into "Rue Sukarno". Dirgahayu Republik Indonesia! 66th Independence Day of Republik Indonesia! VOTE my indinesian muslim brother! too much arabian ppl dzolim to Indonesian ppl. I will not forget what they have done to my ppl, do you remember Ruyati binti Satubi <<< Indo ppl whom you killed yesterday. Bocah_sarbini: As the largest TKI destination country, IT IS IMPOSSIBLE if there is no Social problems. More than 55,000 Indo informal workers at KSA. Everyone who come to any state in the world should obey the formal regulations on that state, including the punishment. That's why Indonesia has consulate office in Jeddah, to help its own people. Dont bring any RL issue here you moron!